The #winelover community now have specialists, we evolve as a community! My speciality is Wine & Archaeology, as I am a winelover but also an archaeologist. Being a specialist I think we should be used. Hence, I challenge my fellow #winelover specialist colleagues to share a post or posts on their speciality on this webpage. This article is on wine & archaeology but with a twist: How did wine end up in Scandinavia and when? When we discuss ancient wine, we need to consider what wine is and what it was conceived as back in the day. It’s very possible that what is called wine in the earliest sources is not what we would have called wine today. The concept of wine has changed over time and place. Today I think we can agree on that wine is fermented grape juice, with a number of allowed additives. But even if agree on that, we still have discussions on how wine should be made. Some prefers natural wine, biodynamic wine, organic wine, conventional wine etc. Some loves wine for its complexity and some just wants to get drunk. Imagine two archaeological sites a few hundred years into the future. At the first one they find a wine cellar, with lots of broken bottles, shards of crystal glass of different sizes and styles, different tools that can be linked to wine, wine openers, perhaps parts of a coravin, gas tanks, stoppers, strainers etc. On the other location they find plastic glasses in quantity, shards after machine-made glass, remnants of tetras, bag-in-box packaging, PET-bottles etc. 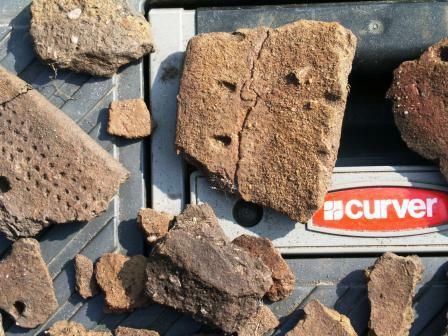 What is common on both sites are the remnants of wine. The sites will give the archaeologists completely different answers on to how we used wine, who drank wine, what wine meant to us and in which situations. Why there’s is a difference and what that mean is the archaeological question. You have to read the artifacts but also interpret them. Just as it is with the archaeological sites and artefacts we find today, they represent a couple of puzzle pieces but most are missing. Some can be completed through comparative studies of other finds or sites, with the old descriptions, secondary or primary sources and through educated guesses. I wonder how much will be left of our digital sources for our future archaeologists? 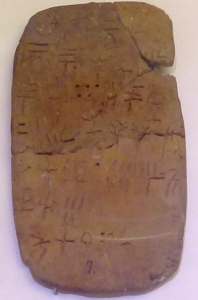 The oldest written sources on wine are clay tablet that dates to ca 2000 BCE. These are receipt and inventory lists for jugs of wine. Do any of you believe that our blogs/apps or tweets will be available in 4000 years? Then again the texts that has survived are scarce and fragmented, not unlike what a twitter conversation may look like to those who are not accustomed to follow it or only see a few of tweets. When it comes to ancient wine, it is not unusual that the wine for different reasons has been mixed with juices of berries or fruit, beer-like beverages, spices, herbs, honey and more. In many cases, we would probably not call them wine today – they might have done so then though. Who is right – them or us? Other archaeological evidence is difficult to interpret. They can show the presence of alcohol or fermentation processes. They might give traces of what the drink was made of, for example grapes, berries or fruit. A questions that makes it more difficultis if everything comes from a single usage? We find grape seeds on many sites, but what do they represent – wine or raisins? 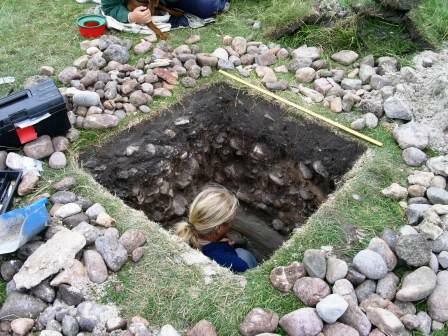 What archaeologists find and interpret is one reality but it is not the reality – if there such a thing. There is always a piece missing in the puzzle, a piece that might change the way we look at history… or in this case wine. That is the one we all want to find! This article is based on a series of articles in the Swedish on-line wine magazine DinVinguide.se, one of Sweden’s biggest online wine magazines and presents a few finds and ideas on how and when prehistoric wine and alcoholic beverages first ended up in Scandinavia. Let’s start from the beginning though! Archaeological records show that wine has been our companion since Neolithic times. 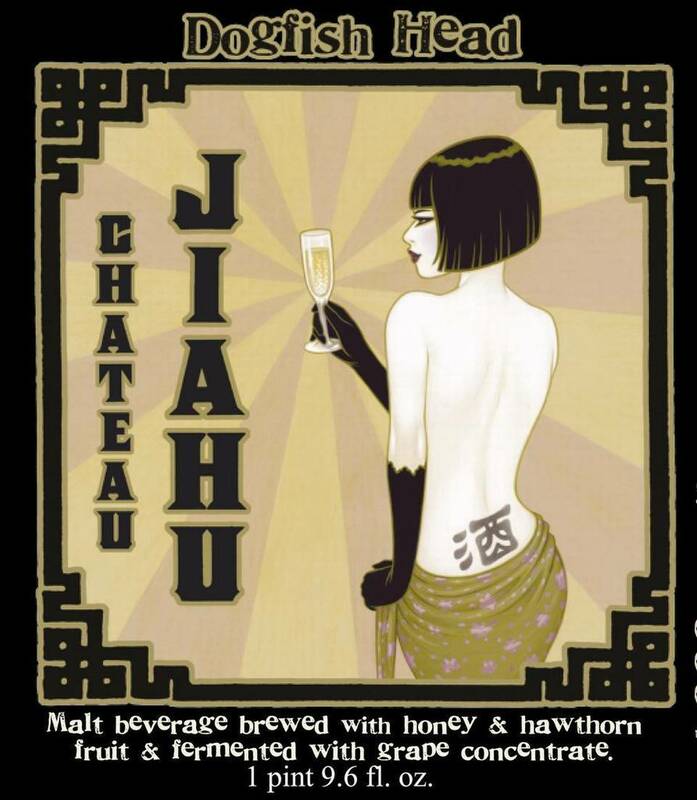 The oldest records of wine or wine-like substances come from Jiahu in China. It is dated to about 7000-6600 BCE. The finds found there can be linked to the early agriculture of China and is a drink that contains a product made from grapes and/or berries, fermented rice and honey. This is not a pure wine; it’s more of a kind of grog with wine as one ingredient. In the archaeological record are also grape seeds and hawthorn seeds. 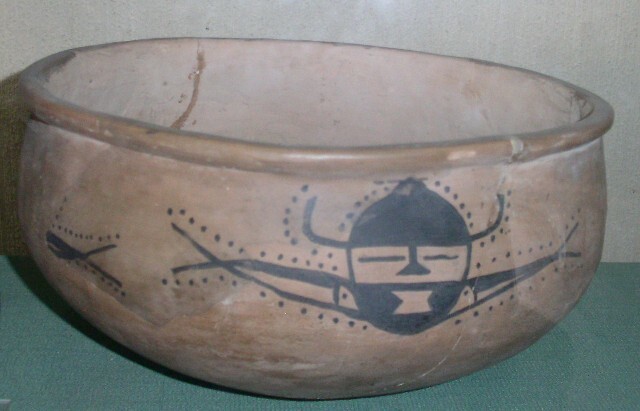 Painted pottery, Yangsaho culture, ca 5000-2500 BCE. The history of alcohol is the history of farming, in China as well as in the Middle East and in Europe. It coincides with the period that is called the Neolithic, a period that began about 10,000 BCE and ended around 4000-2000 BCE. There are those who claim that alcohol might have been the real idea behind agriculture. That they started to grow grain to get starches and sugars to produce alcohol rather than to make bread or porridge. Another important factor to keep in mind is that they learned how to make ceramic objects as pottery, a necessity to ferment and store alcohol. Maybe this was the primary use for them? If we look west towards the Middle East, there is a place in Iran called Hajji Firuz. Here an archaeological find of amphorae dated to 5400-5000 BCE shows traces of wine. What was found are traces of tartaric acid, which is present in grapes and resin from evergreen trees. 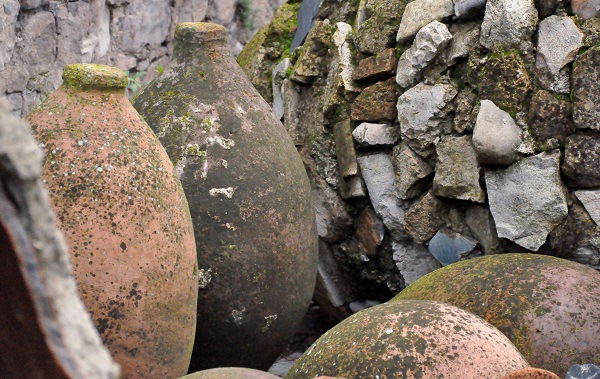 In Armenia archaeologists have found the remains of the oldest winery, dated to 4000 BCE, on a site called Areni 1. Among the finds is a platform to crush grapes from which one can see how they moved the crushed liquid into the storage vessel (large amphorae). In many ways this wine making process is the same still used in Georgia for so-called kvevri wines. This is also a method that began to be popular in some places in Europe in the 1990s, including in Friuli, Croatia, Slovenia, Austria and Sicily, and more. 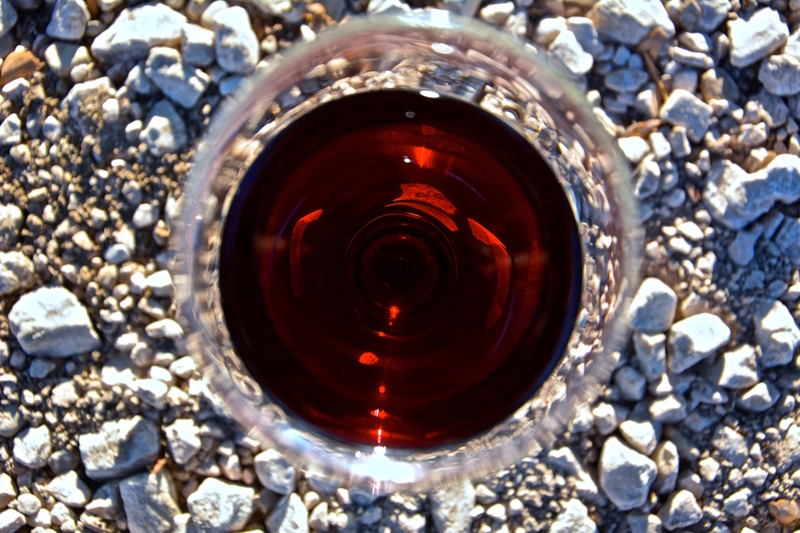 In Europe, the oldest traces of winemaking have been found in Greece, at a place called Dikili Tash. Where they found shell residues and crushed grape seeds, probably for wine production, dated to 4400-4000 BCE. As you notice we are slowly getting closer to Scandinavia, I will go into detail on the sites above, regarding many of them you can read more in Patrick E. McGovern’s book, for example Uncorking the Past: The Quest for Wine, Beer, and Other Alcoholic Beverages (2010). In Scandinavia the Neolithic period started about 4000 BCE and ended about 1800 BCE. Looking to these first farming societies in Scandinavia might mirror other earlier Neolithic societies. The Neolithic’s is a period that can be summed up with a few new concepts – people are starting to build settlement to live, slowly abandoning a more nomadic hunting and gathering lifestyle starting to farm the land, domesticate animals and making pottery. 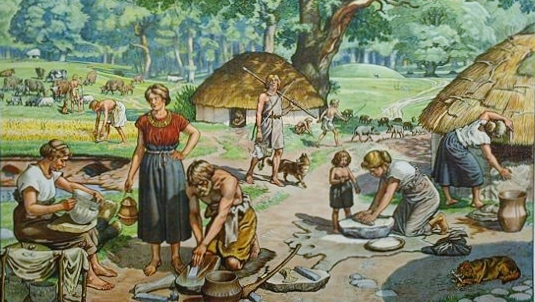 For many this is the image of the Neolithic’s, the happy farmer, but initially they continued much as before, being hunter and gatherers but also starting to keep animals and build small farms. They cultivated small fields; however, they only yielded small amounts of grain. In fact they were so small that they were perhaps more ritualistic in nature than a true source to fill their bellies. Maybe they did grow the crops mainly to produce alcoholic beverages or for other ritual usage? There is evidence that they made bread, porridge and alcohol. Maybe this was primarily for special occasions such as burials and offerings to the Gods etc. 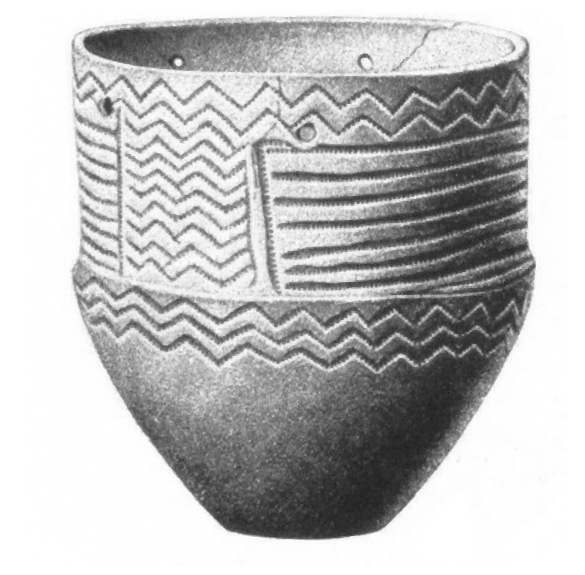 The first farming culture in Scandinavia was the Funnel Beakers (about 4000 BCE to 2900 BCE). A staggering thought is that they might have been the first Scandinavians to make alcoholic drinks. There is no archaeological evidence backing this but it is reasonable to assume the knowledge of how to make it came with the knowledge of agriculture. One of the things needed to make alcohol is starch and other sugars, whether we’re talking wine, mead, or fermented milk (primarily horse milk). The starch could be extracted from grains like wheat and barley. Sugar could be gained from grapes (if they had them), berries, fruit and honey, individually or in combination. The earliest indication of alcohol production in Scandinavia is starch from grains formed in a degradation process of fermentation. It is found on pottery shards in a grave in Refshöj, Jutland, Denmark dated to ca 2800 BCE. If we move forward in time there are several finds from the Bronze Age (1800-500 BCE) in Denmark as well as Sweden. One of the most famous finds is from a grave in Denmark dated to ca1350 BCE – the grave of the so called Egtved girl. Here they found traces of a brew made of honey, cranberry, bog myrtle and wheat grains that are described as a sort of beer or ale. Other types of finds are ergosterol that comes from yeast fungal membranes that are preserved on ceramics. 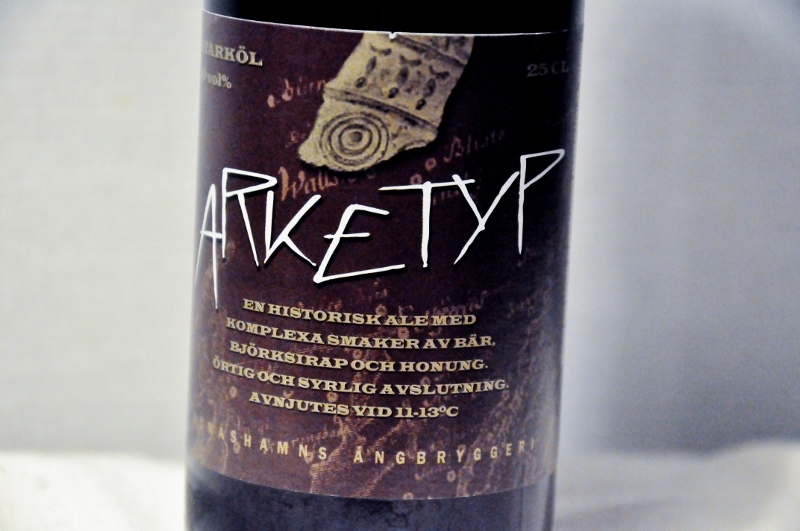 A few years ago Dogfish Head and Nynäshamn steam brewery made a prehistoric beer, Arketyp, based on archaeological findings in Denmark and Sweden from the Bronze Age. Behind some of the analysis was Patrick E. McGovern. The archaeological traces gave a kind of a recipe or rather parts of several recipes that were the basis for a new one. Among the ingredients that was identified were honey, cranberry, lingonberry, sweet gale, yarrow, juniper, birch resin/sap and cereals (wheat, barley and/or rye) and in some cases also wine from the South and/or Central Europe. So this is the earliest evidence that wine got to Scandinavia. It was introduced, at least as an ingredient during the Bronze Age, somewhere around 1500-1300 BC. It might be too early to talk about Scandinavian #winelover-s back then, but who knows what that next ceramic shard will show. As we move forward in time there are more and more people getting in contact with wine and today we even have vineyards and wineries in Sweden, read more here. I do also have a name on the first #winelover of Sweden, or at least one of the first and what he used to drink but that is another story. Now I want to read more from my fellow #winelover specialist colleagues! 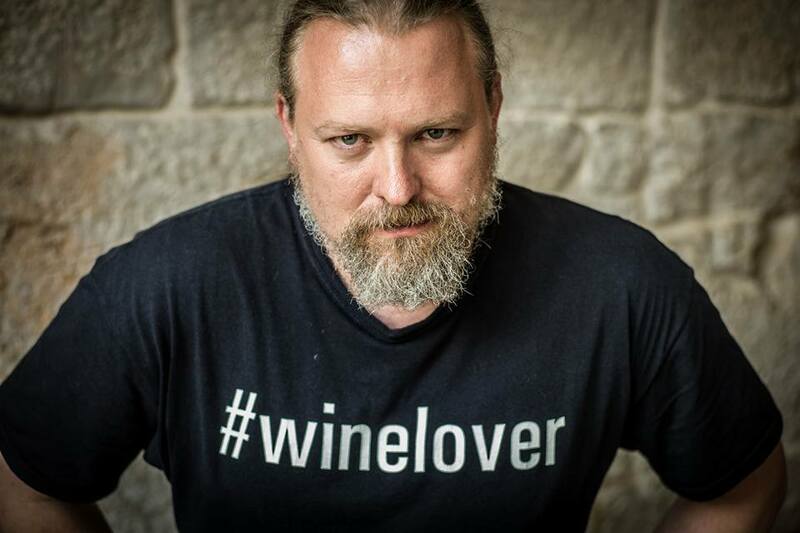 You can follow Magnus on Twitter, Facebook, Instagram, DinVinguide.se, Aqua Vitae Magnus Reuterdahls vinblogg and Tesitmony of a wine junkie. ← #winelover-s Against Cancer. Choose the design of our new t-shirt! How and when did wine get to #Scandinavia?